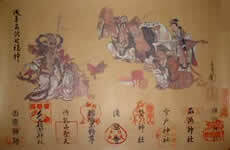 The seven gods of fortune symbolize the wealth and happiness. A lot of virtues are personified in the forms of seven deities.In this respect, they are similar to the Greco-Roman gods.These gods come from India, China and Japan. They are enshrined in shrines, temples and houses all over the country.Their pictures and statue of SHITIFUKUJIN are regarded as something that will bring happiness. Visiting the seven gods, pray for the prosperity in the year. In ASAKUSA, visit nine shrines (instead of seven) because there are two Juroujins and two Fukurokujus. Daikokuten is the god of food and wealth, and it is the most popular of the seven gods. Ebisu is the god of successful business, and it is the only one who is Japan-origin god among seven. Bishamonten is the god of wisdom and bravery. Fukurokujyu is the god of happiness, wealth and long life. Hotei is the god of integrity and magnanimous. Juroujin is the deity of long life and wisdom. Benzaiten is the god of art, and is the only goddess among them, the goddess of protecting women. You receive Fukuemas for your Fukusasa at the nine Jinja and Buddhist temples. Please visit and worship the nine Jinja and Buddhist temples to have the red seals and the autographs on the Shikishi and the Fukue. You visit the nine shrines and tempies to have the red stamps and autographs on the original shikishi. 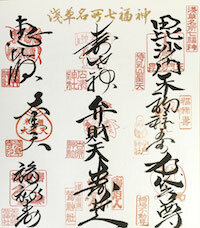 Shikishi is completed with nine as below. The Fukusasa is completed by tying up the nine Fukuemas that you received at the nine shrines and temples. 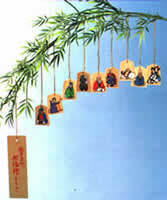 The Fukue is a piece of paper with printed pictures of Shichifukujin. You receive red seals and autographs on the names of the nine shrines and temples.